Isca Ensemble Spring Orchestral Concert 2019 Wagner, Walton, Weber &. Shostakovich 1. Spring concert featuring clarinettist JAMES GILBERT - Wagner, Weber, Walton & Shostakovich. Shostakovich : Symphony No 1. Tickets online for the central block have been selling fast. However, there are tickets available in the side aisles with good visibility of the performance area. Paragon Books, 38 High Street, Sidmouth, EX10 8EJ tel 01395 514516. 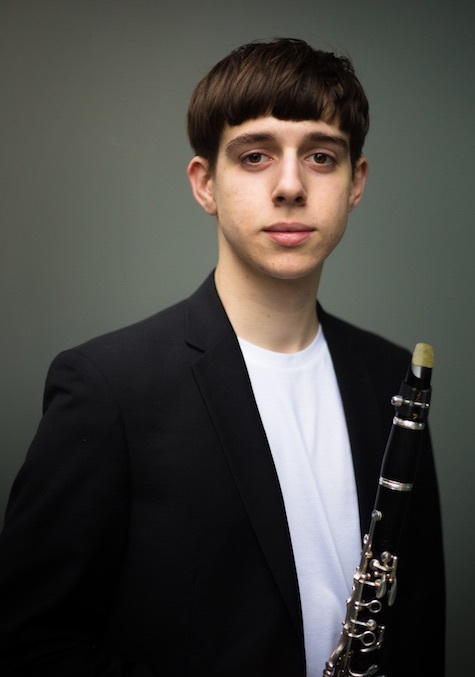 Some tickets will be available at the door at 6.45 p.m.
JAMES GILBERT is currently completing advanced studies with Mark Van de Wiel, Christopher Richards and Laurent Ben-Slimane as a scholar at the Royal Academy of Music. James now enjoys playing in a variety of settings from solo to chamber to orchestral playing. Professionally he has also played under distinguished conductors such as Esa-Pekka Salonen, Vladimir Ashkenazy and Sir Karl Jenkins. Besides Weber's sparkling Second Clarinet concerto, the programme also contains two other spectacular pieces. There were four films released in 1942 with music by William Walton. These helped establish him as a major figure in English music and British film music. The popularity of the music in The First of the Few was such that a recording was made in the same year of the 'Spitfire Prelude and Fugue' with the composer conducting. In the First Symphony by Dimitri Shostakovich we encounter a young artist proudly, exuberantly, even cockily giving free rein to his imagination's wild but purposeful impulses. This is a terrific work for any orchestra to gets its teeth into!